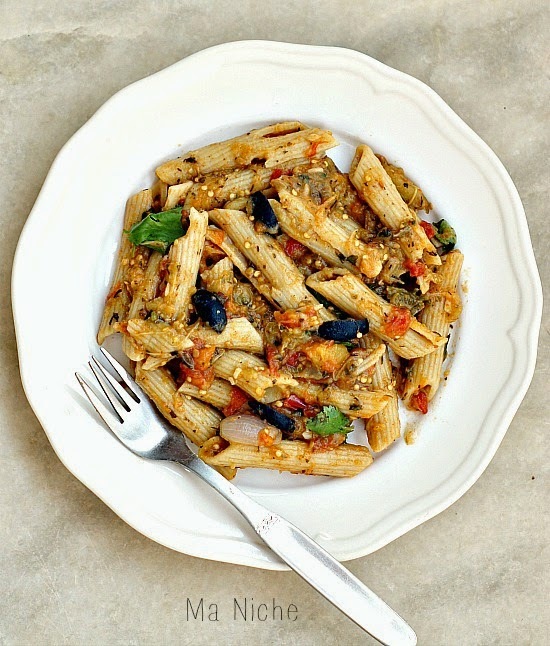 Penne with eggplant sauce... Well a friend had recommended this combination a few months ago. I wasn't sure whether to appreciate it or dismiss the thought of trying it, until the other day eggplants, green pepper and tomatoes were the only vegetables I had at hand to prepare dinner with. A little search on the net showed that the combo is Mediterranean... so I tried since I love everything from that part of the world.... and wow... what a flavorful dish it turned out to be. *I did not have feta, so topped it with mozzarella but I am sure feta or ricotta would be a better choice. Bring a large pot of salted water to boil. Add the pasta and cook according to the instructions on the packet. Reserve 3/4 cup of the cooking water and drain the pasta. Prick the tomatoes with fork. Rub the tomatoes and eggplant with olive oil, put in microwave safe bowl, cover and microwave on high for 5 minutes. After the vegetables have cooled down, de-skin them, and mix them together. If the vegetables cannot be mashed and mixed easily, microwave them on high for another minute and keep aside. Heat the olive oil. When the oil is hot, add the thyme, crushed garlic and chopped onion. Stirring frequently cook until they are fragment but not browned. Stir in the tomato-eggplant mixture. Add salt, chilli powder, basil and cumin powder to the pan and cook for 5 minutes. Stir in 1/4 cup of the reserved water, add the onion halves and bring the sauce to a simmer. Reduce the heat to lowest setting, cover the pan and cook for 7-10 minutes. The sauce would have reduced and thickened by then. Stir in the another 1/4 cup of the cooking water, add the quartered olives, cover the pan and cook for another 7 minutes. The onion halves would have cooked by now. Using a wooden spoon crush the layers of onion into the sauce. Finally add the cooked pasta, the chopped coriander and the remaining 1/4 cup of the cooking water and cook for another 5-7 minutes. Squeeze the lemon juice in, adjust salt and pepper and serve topped with feta and a drizzle of olive oil. a lovely way to get kids to eat eggplant. I love pasta with eggplant sauce. 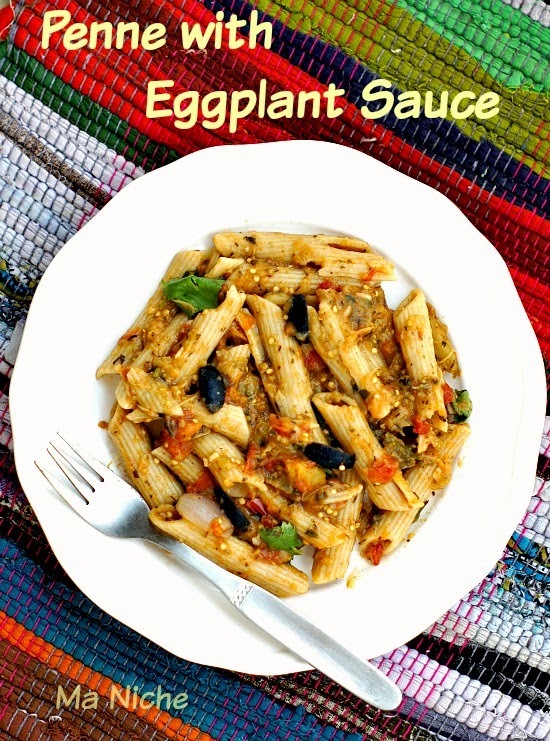 Love eggplant, so I'm such I'd love this dish! This looks so good! I love pasta =) I would love if you would share on my Friday Favorites linkup!